Weekdays 8:00 AM (Mon., Tue., & Fri.) 8:15 AM (Thur.) Subject to change. Please see the bulletin. Adoration: Thursdays 1 – 10 pm in the Chapel of the Resurrection. More about Adoration. Sacrament of Baptism: By appointment after preparation. Contact Mary Grack (mary.grack@churchofstpeter.org) to sign up for preparation classes. Sacrament of Anointing: As needed. 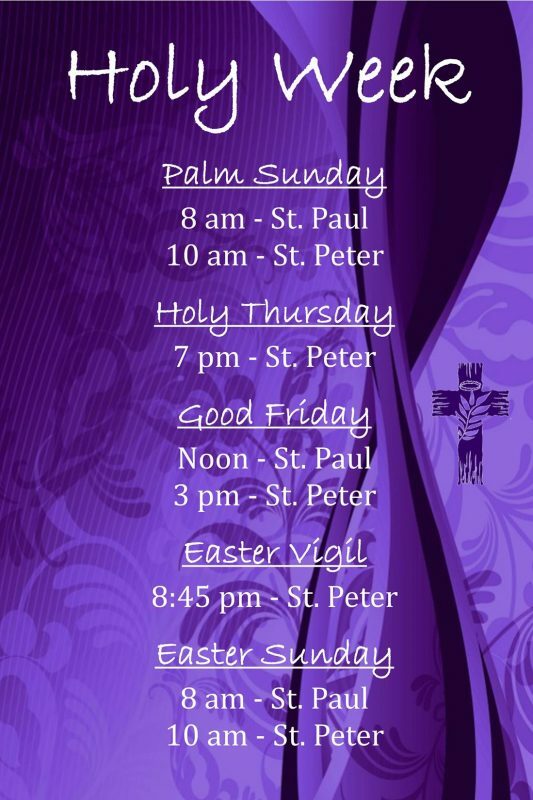 Seasonal Services during Lent & Advent. Sacrament of Marriage: Contact Fr. Todd (todd.petersen@churchofstpeter.org) for details of preparation. Funerals: Fr. Todd (todd.petersen@churchofstpeter.org) is notified of a death and preparations/grief ministry follows.